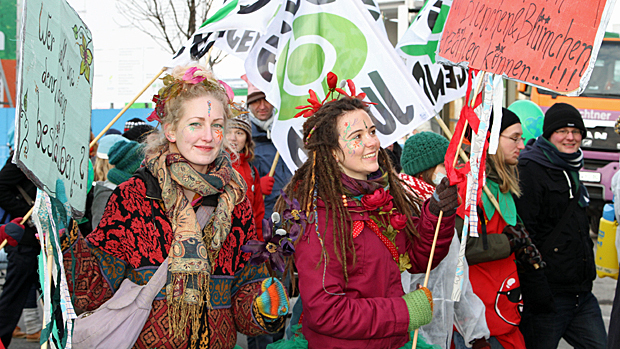 Thousands of people braved the cold and demonstrated in the streets of Berlin as politicians and policymakers met to discuss changes to global agricultural policies. Under the slogan, “We are fed up,” the protesters called for an end to food scandals, genetic engineering and animal cruelty in industrial livestock farming. “We are from the Friends of the Earth and we demonstrate for the peace of animals, small farmers, ecological farming, non-genetic produce animals and non-genetic food,” Viola Wagner said, as she marched and chanted. More than 120 groups representing farmers, industry, and animal rights and environmental activists organized the demonstration. It was timed to coincide with International Green Week, the Agriculture Ministers’ Summit and the Global Forum for Agriculture, which are all taking place in Berlin this week. The event also comes as another scandal in Germany has shaken consumer confidence in the safety and quality of the country’s food. Animal feed fats contaminated with the carcinogenic compound dioxin has again been discovered in the food chain, causing some countries to block German pork and egg imports. Organizers said 22,000 people came from all over Germany, although police estimated turnout closer to 15,000. Following about 50 tractors, they marched from Berlin’s main train station, along one of the main shopping streets, through the government district, and ended with a rally in front of German Chancellor Angela Merkel’s offices. “The current dioxin scandal has suddenly highlighted the backlog of reforms in agricultural policy,” Hubert Weiger, chairman of BUND (Friends of the Earth Germany), said in a speech. In her weekly video message on Saturday, Merkel said the government would tighten controls in the animal feed industry. Meanwhile, some demonstrators also called for changes to Europe’s Common Agricultural Policy (CAP), which is responsible for approximately 40 per cent of the total EU budget. Policymakers are currently deciding how to reform the CAP, which expires at the end of 2013. “The politicians don’t respect enough the environmental issues,” said Moritz Steinbeck, of Young Friends of the Earth. Factory farms disregard animal welfare, and the overuse of chemical fertilizers and pesticides is harming the environment and threatening biodiversity, he said. Across town, more than 80 agriculture ministers, representing 70 per cent of the world’s population, discussed new strategies for global food security. The main issues included reduced resources, a growing population, and the problem of one billion undernourished people around the world, German Agriculture Minister Ilse Aigner said. “We try here at the Global Forum for Food and Agriculture — together with representatives from the political, economical realms as well as regular citizens, to find solutions on how to best deal with investments into agriculture and rural regions for better solutions on how to supply food to the world,” she said, adding CAP is not on the agenda. CAP is of interest to countries like Canada because, in the past, it has been an export subsidy for European agricultural products, providing direct payments to farmers based on how much land they had in production in a base year, said Harald von Witzke, a professor of agriculture economics and president of the Humboldt Forum for Food and Agriculture. The original idea was to help farmers make up for the competitive disadvantage of having to meet stricter quality and environmental regulations than other countries, he said. “Now the question is whether the level of these subsidies should be reduced because the CAP is the single most important budget item of European Union. And the second is whether it should be more equitable because now the West European member countries get higher payments than the East European member countries,” he said. No one from Agriculture and Agri-Food Canada is attending the meeting, but the department is monitoring the CAP discussions, a spokesperson said in an email.